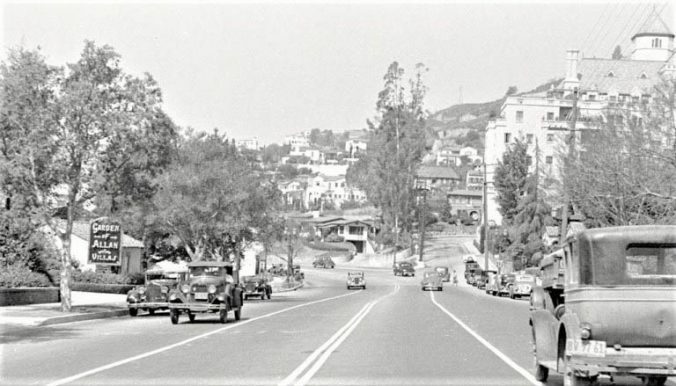 In the early 20th century, the eastern end of the Sunset Strip was lined with large homes, including more than a few mansions and country estates. Few of these remain today, however, but in a photo recently published by friend-of-Playground Martin Turnbull, we spotted a house that, though greatly transformed, is still standing. I’ve been researching and writing about the Garden of Allah Hotel for more than ten years now, so it isn’t often that a new photo surfaces—but it IS exciting! We’re looking west along Sunset Blvd from Crescent Heights Blvd. On the left we can clearly see the ‘Garden of Allah – Villas” sign—it’s actually more striking than I pictured. As Sunset curves around to the left, on the right we can see the Chateau Marmont Hotel, which went up a year or two after the Garden of Allah, and which is still around today. 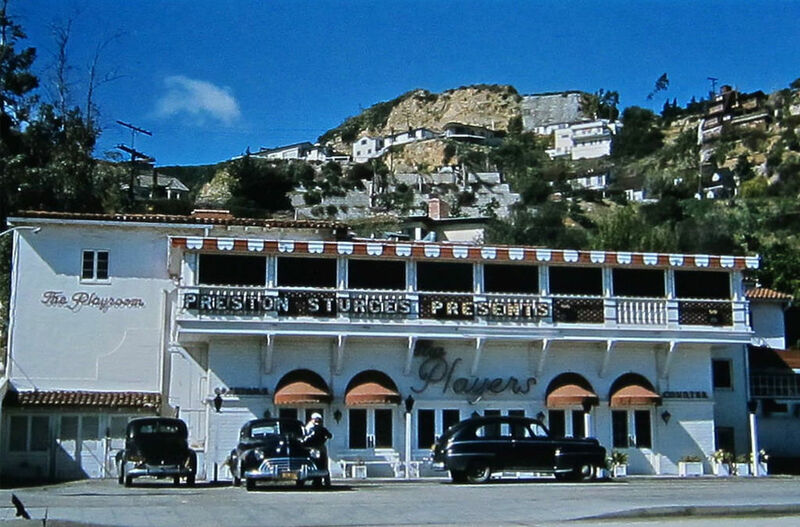 The license plate on the rear of the car in the right foreground is probably from 1936, so can date this photo to circa mid 1930s. We know a few things about the residence. It was once the home of William Morris, a well-known stage actor who was the father of Chester Morris, who was a big star who got his start playing Boston Blackie in the popular serial and went to appear opposite Norma Shearer, Jean Harlow, Wallace Beery and Robert Montgomery. The house was later used as a wedding chapel, which may be its purpose around the time this photo was taken. In 1940, it was purchased by Sturges, one of the most innovative directors in the studio era — the list of films he directed includes “The Lady Eve,” “Sullivan’s Travels,” “The Palm Beach Story” and many more. 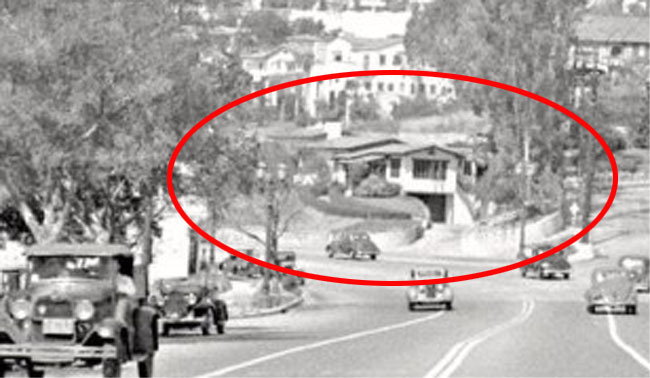 Sturges excavated the hill in front of the house — shown to the right of the structure in the photo — to create space for the parking lot. 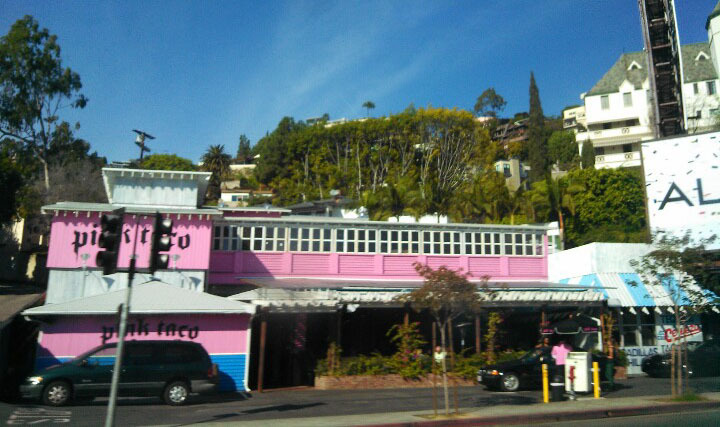 He then apparently built a ground floor under the basement of the house, which is now the main floor of the Pink Taco.